I love to make homemade fudge! I probably make up a pan of fudge every month for my family to enjoy. 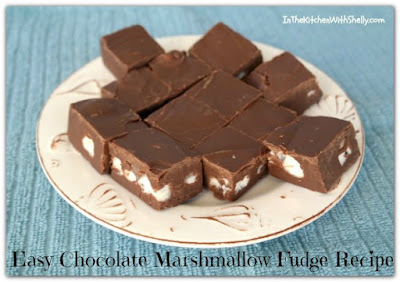 On top of that, when our church holds their bi-annual bake sale...I whip up several batches of fudge for that! Making fudge is NOT a hard process and it works up super quickly with this easy recipe. Prepare an 8" square baking dish by lining it with a piece of aluminum foil or by lightly greasing it with butter. Set aside. In a large saucepan over low heat...combine and melt together the semi-sweet chocolate chips with the 2 tbsp. of creamy peanut butter. Stir constantly until smooth. Remove from heat and stir in the tub of chocolate fudge frosting until well-combined and melted. Stir in the miniature marshmallows until combined. Pour mixture into your prepared 8" square baking dish. Cover and place into the refrigerator for 2-3 hours or until firm. Remove and cut into squares. Note: Fudge freezes well. Just wrap each piece of fudge in plastic freezer wrap or waxed paper and then place the squares into a freezer container or freezer bag. Will keep for up to 2 months. This is a very easy recipe to make fudge. I think I would prefer to use dark chocolate chips or even add a little unsweetened chocolate bits and/or nuts to make the fudge more interesting.